Novellini GLAX 2 and GLAX 3 complete shower cubicles will grace your bathroom with beautiful Italian state-of-the-art design. Opaque glass wall panels eliminate the need for traditional tiling and in doing so remove the headaches associated with leaky tiling. Each model within the GLAX range is available with an equipment level to suit your desire. 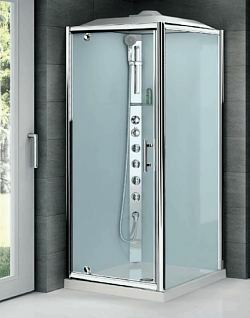 All units are supplied with thermostatic shower control with hydro massage body jets as standard. 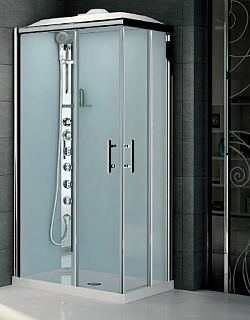 The GLAX 2 model is available with or without a roof dome, and the roof dome model incorporates a built in shower head. GLAX shower pods also have a choice of shower tray. The first being a 'low' shower tray that beds flush on the floor presenting a low profile and minimal threshold to step over. It should be observed that the low nature of this tray requires waste to be run below floor level. The second tray option is the 'high' tray. This more traditional shower tray rests on compensator legs. The higher profile of the tray permits the waste to be run above floor level if desired. 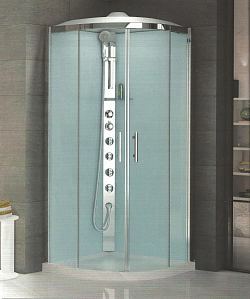 Novellini GLAX leak free shower pods represent the pinnacle in luxury with the ultimate in leak free design. 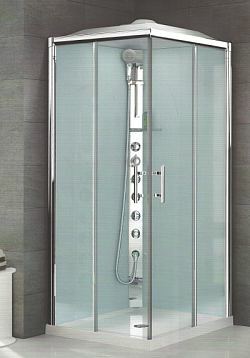 Novellini shower pods are supplied with a choice of brushed silver or chrome trim and clear safety glass that is coated in Crystal Clear treatment to prevent the build up of bacteria and lime scale. This range does not require silicone.